The core of myGate is innovation and thought leadership in the sphere of security. Our team is continuously improvising the product to introduce new trends in the security space of gated communities. A case in point being the introduction of e-intercom solution which is disrupting the way visitor authentications are done in gated societies. We started of the process building our e-Intercom by first understanding the way gated communities communicate/ authenticate visitor entries within the apartments. Wired intercom also known as PBX (Private branch exchange) is most commonly used. We understood the working of this system, the effort required to install and the associated challenges. Click here to read the entire study on wired intercoms. Keeping in mind the various aspects of a wired intercom, we introduced e-Intercom to overcome and improve this outdated system of authentication. This feature of myGate is breaking the general norm of how visitor authentications are done in a gated society. With e-Intercom, the resident can approve/reject the entry of a visitor from wherever he/she is. The moment a visitor enters the society, the guards takes their essential details like mobile number, name and the flat/villa details they want to visit. For delivery boys, details about the company they are from and their photo is also taken by the guards. Once all this information is entered into the guard app and submitted, an in-app notification about the visitor’s arrival is sent to all the residents on their mobile. The app notification on the mobile gives the resident an option to either allow or deny the visitor’s entry into the society. In case the residents do not respond to the message, or if the resident has poor or no internet connectivity or has not downloaded myGate app, myGate servers will generate an automated IVR ( Interactive voice response) call to designated number ( a primary and a secondary landline or mobile number) which is provided by the residents, in order to seek their approval. If the resident does not respond to any of the above steps, as the last resort the guard tries to reach out to the resident via the wired intercom. How much does e-Intercom cost? 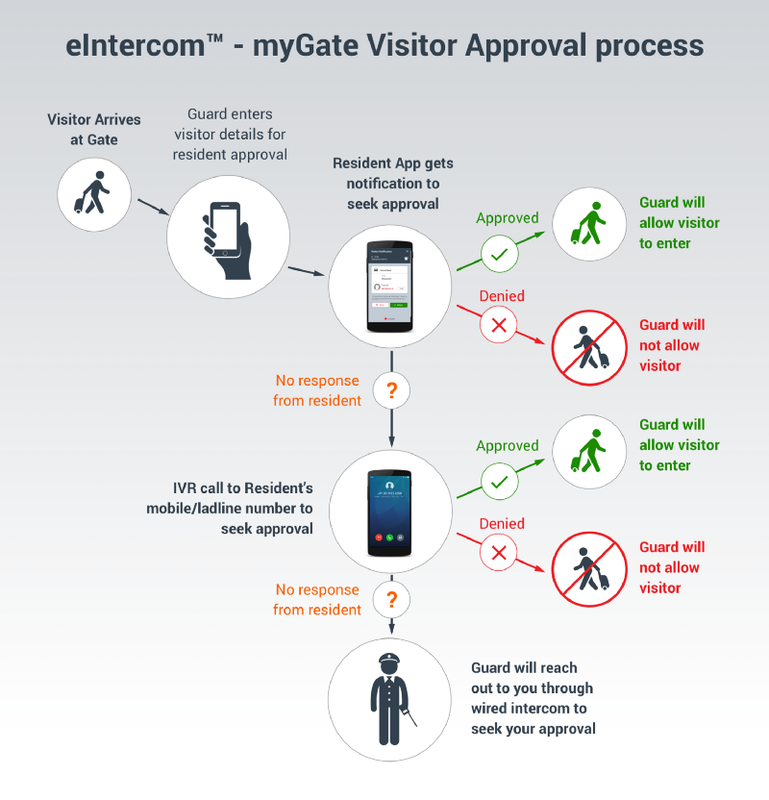 We believe that living in a secure environment is an ever growing need and hence myGate’s e-Intercom feature is available at zero hardware/ infrastructure cost. We also undertake the complete training of the security guards and the facility managers of a society . In addition, there are regular refreshments/up-gradation training sessions held for all the guards and facility managers.